In The Wolves, characters are known only by their jersey numbers. Playwright Sarah DeLappe says she wanted to portray them "not as daughters, not as girlfriends, not as sexual objects, but as athletes." When playwright Sarah DeLappe was growing up, she loved war movies. 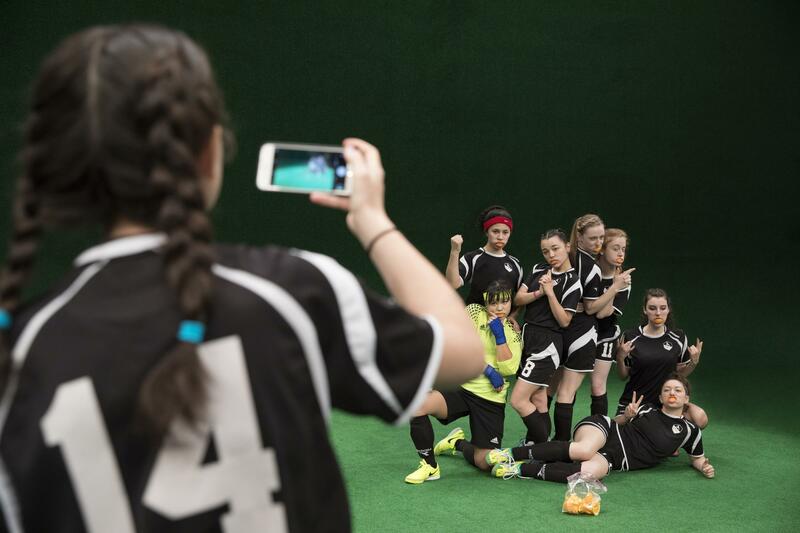 So she decided to write a play that was like a war movie – but about girls soccer. The Wolves opens at New York's Lincoln Center on Monday. As the lights come up, nine teenage girls are in a circle atop a green expanse of artificial turf, stretching before a match. And they're all talking at once. "When we start the play we're immediately on a planet of teenage girls," DeLappe says. "Instead of following a brigade of young men in the trenches or preparing to go to war, we're following a team of young women who are preparing for their own sort of battle on the soccer field." And the team is filled with young women who might, at first appear, like archetypes – the captain, the rebel, the innocent, the new one. But as the play goes on, these adolescent girls reveal themselves in surprising ways. DeLappe gave each character a number rather than a name. She says she wanted the audience to know them: "as soccer players — not as daughters, not as girlfriends, not as sexual objects, but as athletes." The play charts this elite team as it goes through a season, hoping to make it to nationals. An abortion is revealed, an eating disorder is discovered, friendships are made and fall apart. "The show is actually pretty physically demanding," says Susannah Perkins, who plays No. 11. "It's sort of like a dance piece." Director Lila Neugebauer – who was captain of her high school team – put the actors through their paces. "I trained them like a soccer team," she says. "We ran, we did soccer-related fitness, and we did drills and we scrimmaged." And it shows. The actors are in constant motion, whether stretching or passing the ball to each other. "You're like — left right, left right, left right, kick the soccer ball, run offstage," says Midori Francis, who plays No. 8. "And at the same time, you also have to be acting." Although the young women of The Wolves live in a relatively privileged world, author Sarah DeLappe says they end up – like in a war movie – having to deal with death. "The play starts with this sort-of glib discussion of others suffering," DeLappe says. "And by the end of the play that suffering has come and visited them on their own turf and they have to learn how to cope with it." After Lincoln Center, The Wolves will be licensed to professional and amateur theaters around the country – so it might be coming to a high school near you. When Sarah DeLappe was growing up, she loved war movies. So she decided to write a play that was like a war movie but set in the world of girls' soccer. It's called "The Wolves," and it's being staged at New York's Lincoln Center. Jeff Lunden reports. JEFF LUNDEN, BYLINE: The lights come up on a green expanse of AstroTurf. Nine teenage girls are doing stretching exercises before an indoor match, and they're all talking at once. UNIDENTIFIED ACTRESS #1: (As Character) But it's like he's old. UNIDENTIFIED ACTRESS #2: (As Character) He murdered thousands of people. UNIDENTIFIED ACTRESS #3: (As Character) Literally hundreds of thousands. UNIDENTIFIED ACTRESS #4: (As Character) Have you played with it before? SARAH DELAPPE: When we start the play, we're immediately on a planet of teenage girls. DELAPPE: Instead of following a brigade of young men in the trenches preparing to go to war, we're following a team of young women who are preparing for their own sort of battle on the soccer field. UNIDENTIFIED ACTRESS #6: (As Character) No. No, it's not. It's not insensitive. DELAPPE: As soccer players - not as daughters, not as girlfriends, not as sexual objects but as athletes, which is why I wanted to only give them character numbers as opposed to names. LUNDEN: The play charts this elite team as it goes through a season hoping to make it to nationals. An abortion is revealed. An eating disorder is discovered. Friendships are made and fall apart. SUSANNAH PERKINS: I'm Susannah Perkins. I play Number 11. The show is actually pretty physically demanding. It's sort of like a dance piece. LUNDEN: Director Lila Neugebauer, who was captain of her high school team, put the actors through their paces. LILA NEUGEBAUER: I trained them like a soccer team. We ran. We did soccer-related fitness. And we did drills, and we scrimmaged. UNIDENTIFIED ACTRESS #7: (As Character) Mud cakes! LUNDEN: The actors are in constant motion, whether stretching or passing the ball to each other, says Midori Francis, who plays Number 8. MIDORI FRANCIS: You're like left, right, left, right, left, right. Kick the soccer ball. Run off stage. At the same time, you also have to be acting. UNIDENTIFIED ACTRESS #8: (As Character) Could I play striker? UNIDENTIFIED ACTRESS #9: (As Character) Seven is striker. Seven has always been striker. UNIDENTIFIED ACTRESS #8: (As Character) Oh. UNIDENTIFIED ACTRESS #9: (As Character) It's just - we're undefeated. And we want to stay undefeated, right? Especially with the college showcase tournament coming up. LUNDEN: Although the young women of "The Wolves" live in a relatively privileged world, author Sara DeLappe says they end up, like in a war movie, having to deal with death. DELAPPE: The play starts with this sort of glib discussion of others suffering. And by the end of the play, that suffering has come and visited them on their own turf. And they have to learn how to cope with it. LUNDEN: After Lincoln Center, "The Wolves" will be licensed to professional and amateur theaters around the country. So it might be coming to a high school near you. For NPR News, I'm Jeff Lunden in New York. Transcript provided by NPR, Copyright NPR.